Good morning everybody! It's Wednesday and I have loads of recipe posts in the backlog just waiting to make their way out into the world... but they're on hold for the moment because I couldn't not talk about Crispy Rendang. 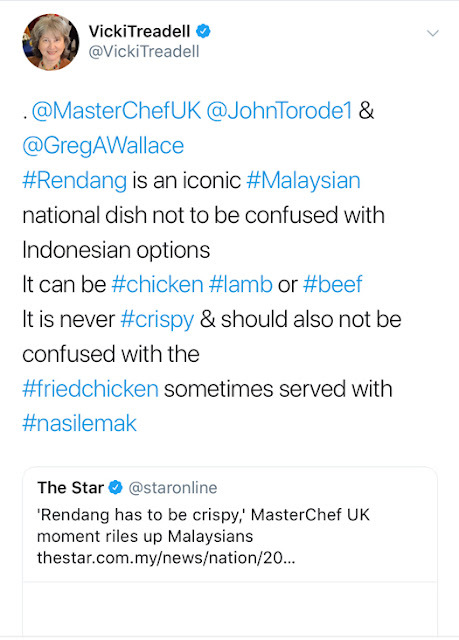 Two Masterchef UK judges almost caused an international incident when they criticised a Malaysian-born contestant's chicken rendang for not being "crispy". 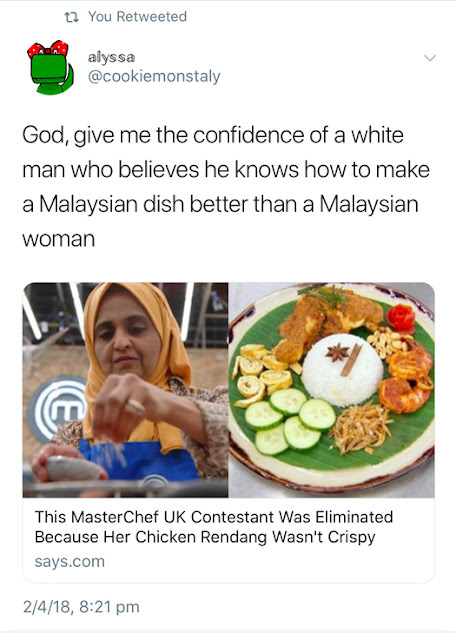 So: last week, Masterchef UK contestant Zaleha Kadir Olpin was eliminated from the competition after the judges, John Torode and Gregg Wallace, deemed her chicken rendang not up to scratch. Some of their comments were reasonable. John, who has travelled extensively throughout Malaysia and his filmed cookery programs there, stated: "It hasn't had enough time to cook down and become lovely and soft and fall apart. Instead the chicken itself is just tough and it's not really flavoursome." Harsh but fair. However, it was Gregg's clanger of a comment that caught the collective ire of my people: "the chicken skin isn't crispy, it can't be eaten". For those who don't know, rendang is an incredibly flavourful slow-cooked dry curry, beloved throughout Malaysia, Indonesia, Singapore and Brunei. (I believe it originated in West Sumatra ages ago, and has since become a national dish in all four countries). It ain't ever going to be crispy. 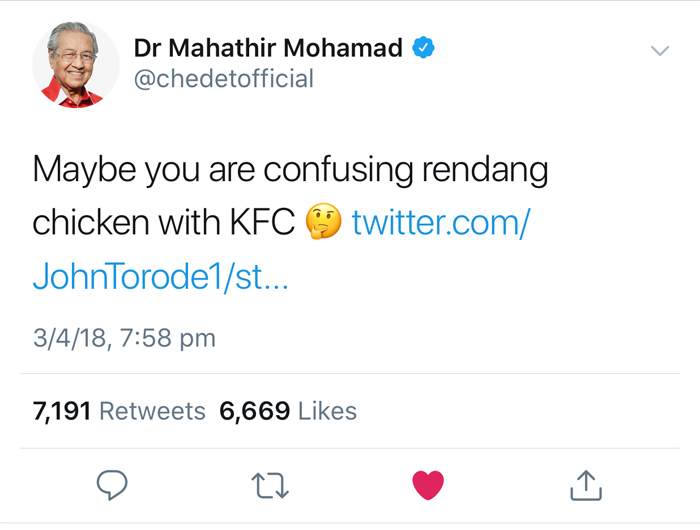 If your chicken is crispy, then what you have is not a rendang. Malaysians tend to be pretty chilled as a people, but when it comes to food, we do not mess around. We literally have no chill. Twitter and Facebook basically blew up with extremely impassioned comments from Malaysians. We love our food, we know our food, we are proud of our food. Gregg Wallace, who is supposedly knowledgable enough to be a judge on an international cooking program, demonstrated a lack of understanding of our cuisine and this would not stand! People definitely interpreted the exchange as an example of whitesplaining or having neo-colonialist undertones. The main thing that got me was that I hated the idea that a Malaysian contestant worked so hard to present a dish that was meaningful to her (and meaningful to us), only to have a judge with far less knowledge criticise it for a completely erroneous reason. (You can watch the full video here). There have been lots of hilarious tweets and memes floating around, but this one in particular really tickled me. Gregg seems to have remained silent on Twitter. 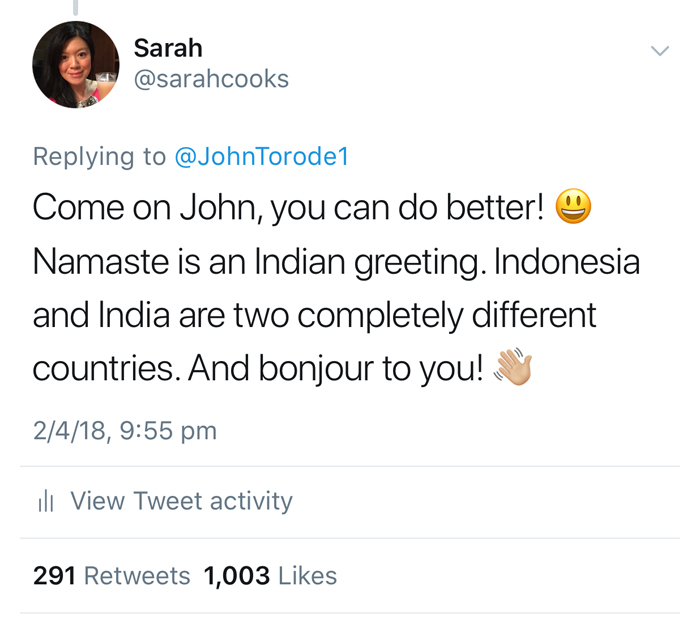 But John, bless him, doubled down with this culturally insensitive tweet. My response on twitter basically said all I have to say about this. I am not super active on Twitter (unless you count my constant re-tweeting Simpsons Quote of the Day), but this little tweet of mine went nuts. People really cared about Crispy Rendang. And it wasn't just Malaysians! 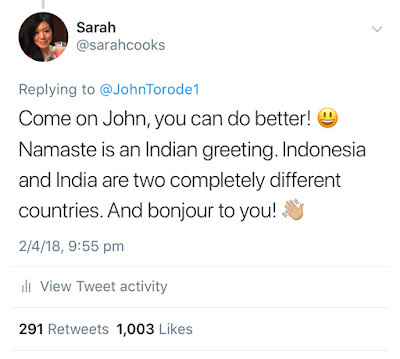 Indonesians, Bruneians, Singaporeans too - basically, all the major rendang countries, uniting! Even Prime Minister Najib and ex-Prime Minister Mahathir got in on it. See? I told you food is important to us! 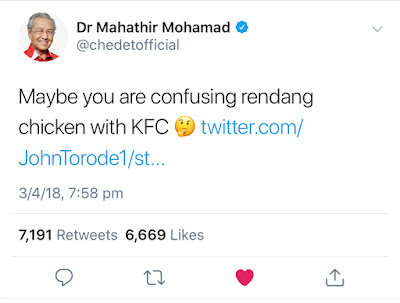 I don't think Mahathir or Najib agree on much, but Crispy Rendang is something we can all get behind. "Where do people eat "crispy" chicken rendang?" Well done to Victoria Treadell, British High Commissioner to Malaysia, for keeping her cool and explaining the sitch. Also shout-out for the extensive use of #hashtags. This post from the US Ambassador to Brunei, Craig Allen, was a funny and light-hearted surprise in my insta feed! After all this rendang business, I seriously craving Malaysian food! 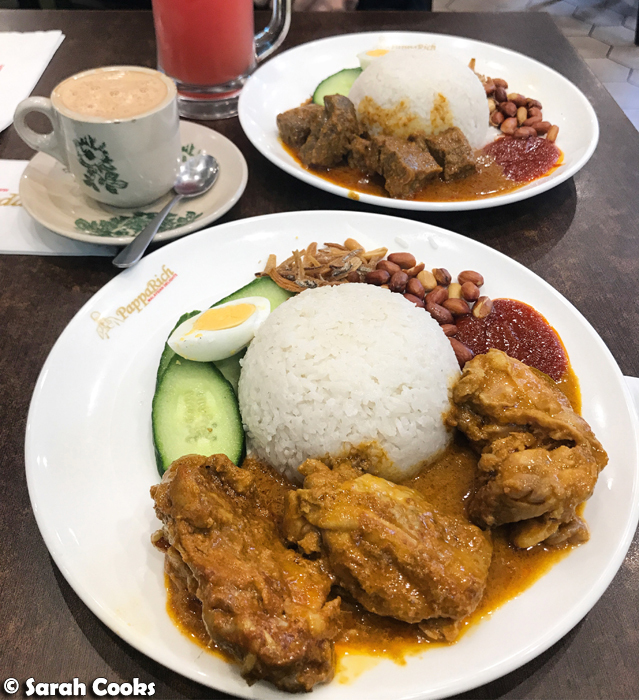 I convinced a coworker to get rendang with me for lunch at PappaRich. They don't sell chicken rendang, so I had a chicken curry and he had a beef rendang. None of the meat was crispy and everything was delicious. But that didn't quite satisfy my rendang craving, so last weekend I embarked on a little cooking project and made chicken rendang from scratch! I'd never made it before, and it was so much work, but so worth it! I bought all the ingredients, I peeled all the shallots, I made the rempah, I toasted the coconut, I pounded the kerisik. Serious Malaysian housewife! 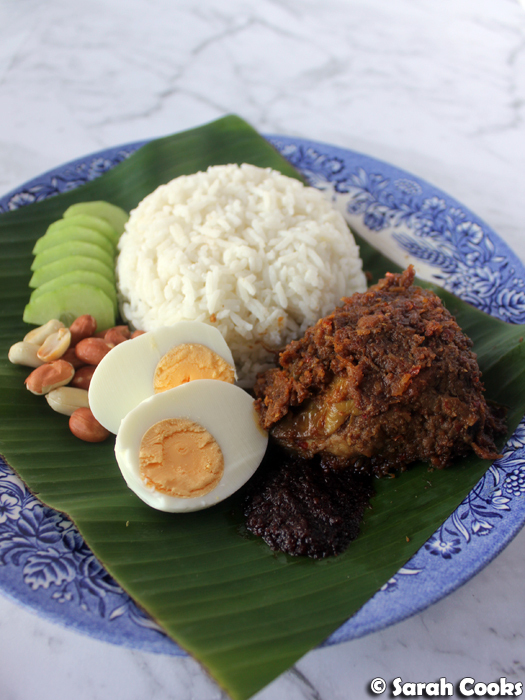 I served it nasi lemak style, with coconut rice, cucumber, a hardboiled egg, fried peanuts and sambal blachan (bought, not made, because there was only so much work I could cope with that day). I couldn't find any ikan bilis, but next time! And guess what? Guess what? The next day, I also made CRISPY CHICKEN RENDANG. Yes, for real. I had an idea for crispy chicken rendang in my head all week, and I'm glad to say my experiment paid off. I took the leftover chicken meat and sauce from the rendang, chopped it up finely and made spring rolls. TADAH. 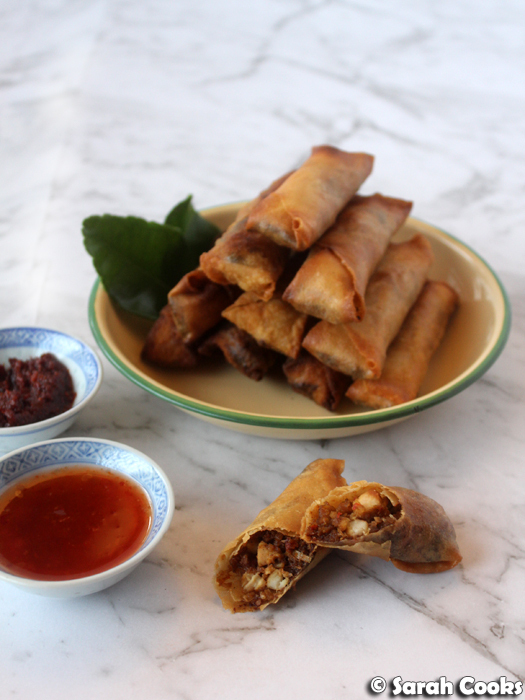 Crispy Chicken Rendang Spring Rolls! They were super delicious! And I gotta say, I felt extremely patriotic after my two days in the kitchen. I gave some to an Indonesian friend of mine, who said they tasted "Nyonya-style", which made me happy because I am of Nyonya descent. So I guess my instincts were right! I don't think it would be too much of a stretch to call these kay choon pneah! 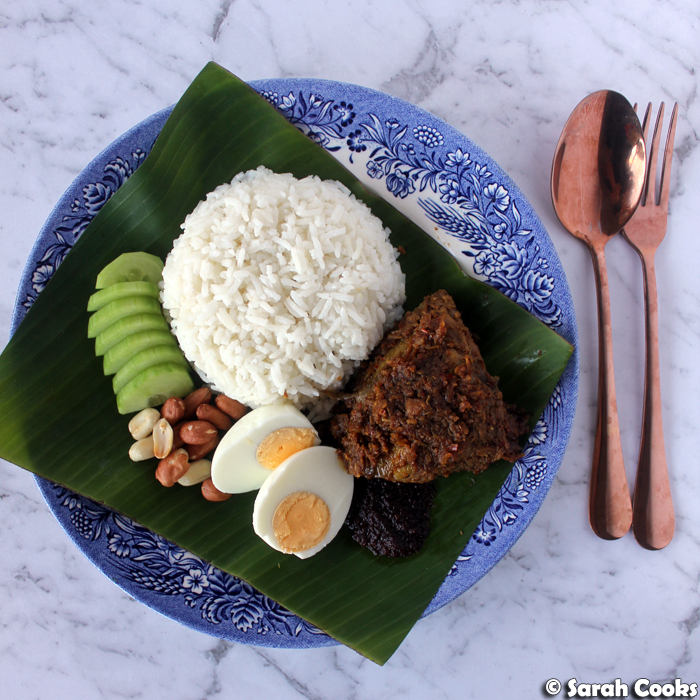 I hope you enjoyed my post on Crispy Rendang! I'll be posting my recipes for chicken rendang and crispy chicken rendang spring rolls this week. 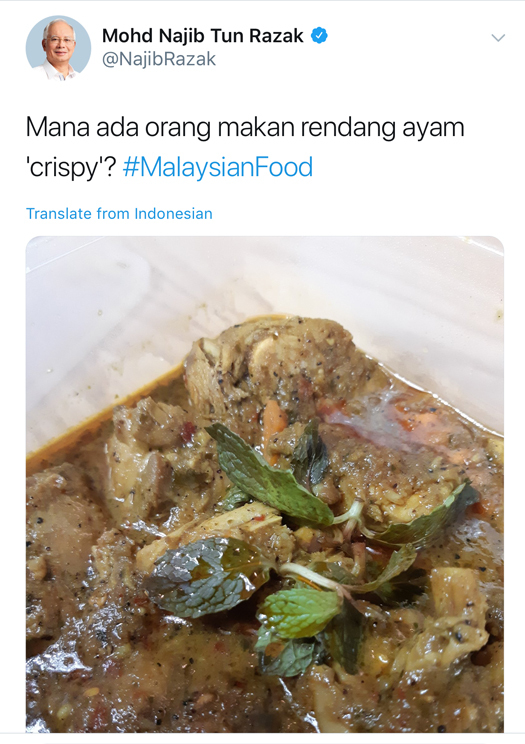 Did you follow Crispy Rendang? What did you think? What would you cook in a competition if you had to pick something meaningful to you? I'm glad that I'm living in a time and age where people like him are being called out for being clueless. But I'm unimpressed that he hasn't addressed the issue. Seriously, that's the least he could do. I guess we just need to expect less from people like him lol. Yeah, I agree. It's a shame they didn't respond in any meaningful way, but I'm glad people are comfortable calling it out when stupid comments are being made!